If you are a home buyer looking for new construction in Midtown Atlanta, you know it pretty much does not exist. But the frozen new construction market seems to be thawing…and Park Modern Midtown Atlanta is one of those options. This new 18-home community will not be for the faint of wallet, however. Located on 14th Street and 14th Place, home prices will most likely be in the high 900’s and the prime front corner home on 14th Street may hit around $1.5M. 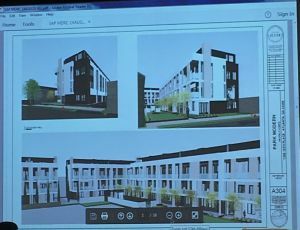 The new 4-story townhomes will feature 3- 4 bedrooms, 2-car garages and rooftop decks. Community amenities will include a lap pool, park area and a dog run. The community has grown in size from its original presentation with the addition of the “leg” of property fronting 14th Street. This was where The Dowling condo building had been proposed, but never got out of the ground. It’s that front corner where the most expensive home will be located. 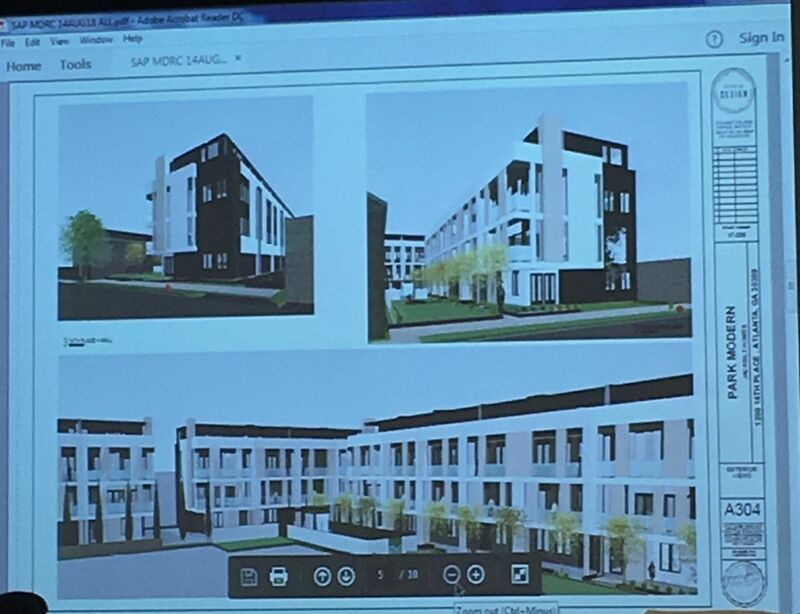 We learned about this project at the DRC Meeting with Midtown Alliance. So we did not have a copy of the plans, and tried to capture some photos as the presentation was being made. We’ll keep an eye out for more information and floor plans, and you’ll find a page here at MyMidtownMojo.com once it becomes available and we can share it. After the meeting, we passed by the site. You really forgot about these apartments tucked back on 14th Place, and know that this will in one sense be a blow to the affordable rental opportunities in Midtown Atlanta.